So, now it seems that my workplace has turned into a thieves training ground. Woodly bought the tools, and we’ve acquired a few more locks. Meanwhile, Psym, the owner of celebrity ninja has been concentrating on thoroughly mastering our level 2 lock. Yes, it’s a relatively easy lock, but I tried for half an hour and couldn’t do it until Psym showed me how. Wow. 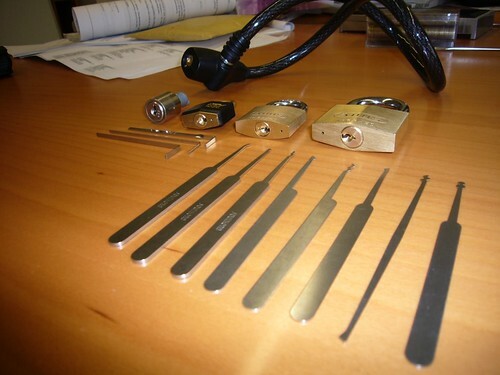 Lockpicking is a proper geek skill. I’m impressed.